Some days you feel like a bright color, classic trousers, and a simple look. And some fabulous add-on hair, why not? We’re Not Dead Yet. We wear what we love, and feel good doing it. 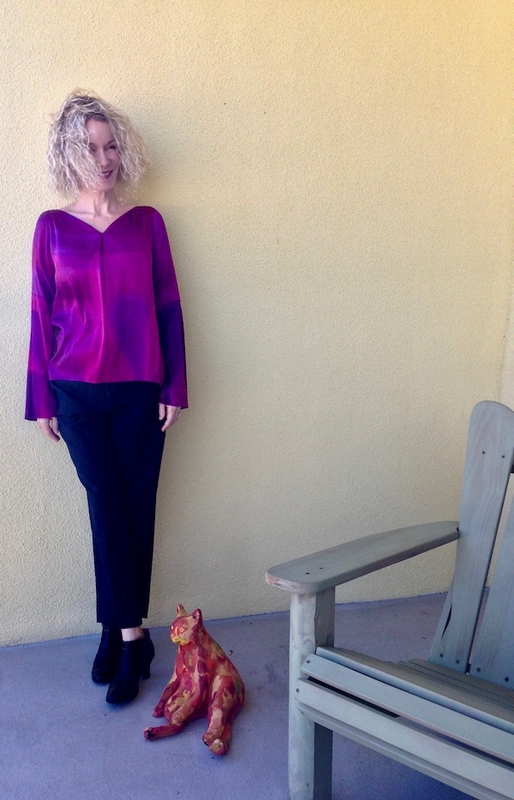 This vibrant silk blouse (similar) is by Tahari, thrifted a few months ago for under $10. I have washed it by hand and it comes out beautifully. The trousers are newly-thrifted by Talbots (sim), in a new silhouette for me: cropped (a little) and flared (a little), worn with black low heeled Naturalizer booties (sim). I like it, it feels fresh. The amazing hair, so close to my own but thicker and better-behaved, is an Ellen Wille wig – the Wiki. It’s synthetic hair with an amazing curl pattern and it feels like the silkiest human hair. Multiple thumbs up for this wig brand, whose prices hover around $250 – but I got mine at a 30% off sale. It’s so great to have alternate hair to pop on my head when the real deal is not cooperating! 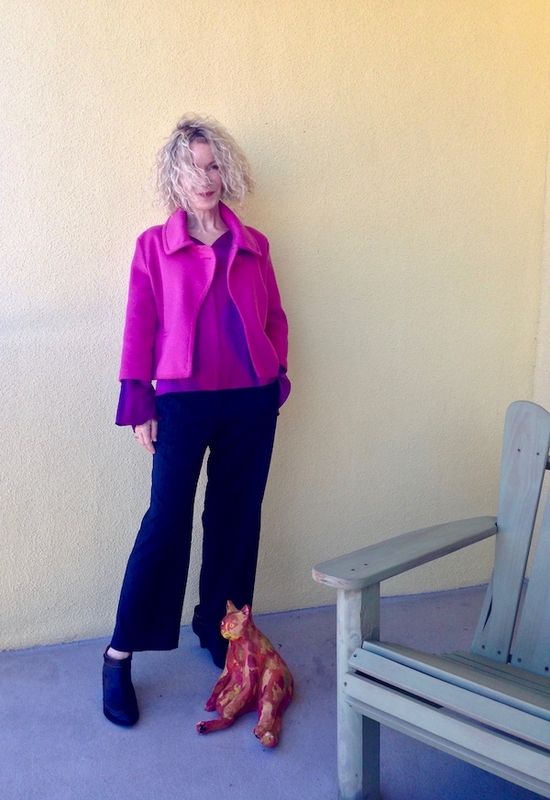 I added my new favorite Cynthia Rowley hot pink jacket. 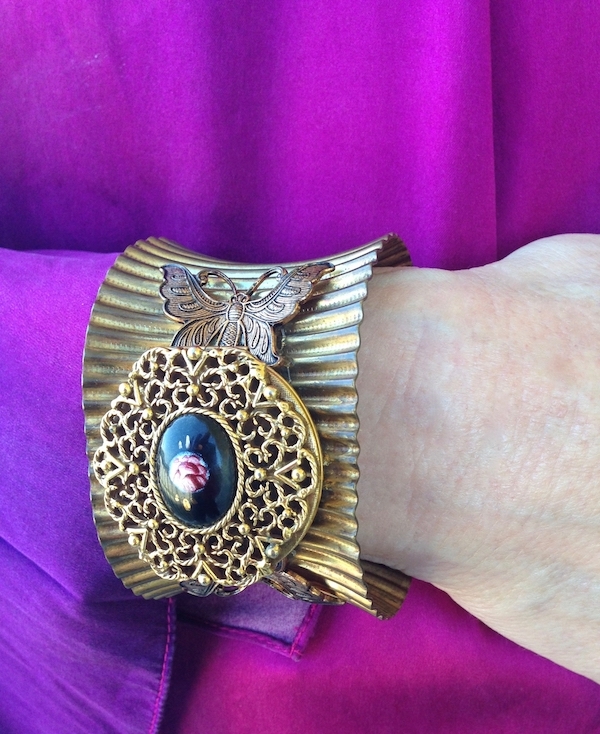 I adore this chunky, mixed-era hand-crafted cuff. Sandy bought it for me via Citizen Rosebud’s shop. I really, really, REALLY like this outfit. All the elements just seem to come together, the cut, the colours. I had no idea that wasn’t your own hair. Excellent wig. What I love about the hair though is how it is blowing in the breeze. Beautiful, Patti. Thanks for this linkup. Gorgeous colors on you and I’ve always loved that cuff!!! That hot pink, fuchsia, whatever color you want to call it…that is one of my favorite colors in the entire universe. Seriously cute swing jacket! I actually deliberately dressed to be invisible all weekend (’twas the nature of my holiday), but I’ll come join you tomorrow, Patti! Oh my Patti, your outfit is stunning! I love that bright pink on you, especially paired with the pink jacket. And, I never would have believed that you were wearing a wig, it looks just like your normal hair, which I think is fabulous! Would love to have your hair. Thank you for hosting! Patti this a wonderful look you’ve put together here! I love these flared cropped trousers – not something I’ve tried, but you rock them! And that pink jacket is a favourite of mine made all the better by those shirt sleeves, what a great move. Thanks for the link up party again this week. Love those crops on you and your gorgeous curls! That is an unique looking bracelet and I love it! And your blouse and jacket is lovely! I hadn’t seen you were wearing a wig. Indeed very close to your own hair. And I love, no adore the top. So my thing, the colour, the shine, the brightness, the shape. It surprised me that it goes so well with that gorgeous jacket. But it does. Wow! That wig truly looks like your own hair. Brilliant. Also it stays on in the wind! The colour of this blouse is so wonderfully vibrant. Such a great eclectic mix of pieces. It creates so much more interest to mix things up. First of all, you look stunning, Patti! I always love seeing you in a bright color. it really flatters your complexion. Love the cropped pants (my personal favorite!) and the booties work perfectly. As for the wig – never in a million years would I have guessed that was a wig! Looks so real! Wow, I love that bracelet! Unique and one of a kind 🙂 Patti this is a great color on you, perfect with your skin tone, and love the hair, how neat! That is such a fun outfit! I especially love the color of your top! That so does not look like a wig! How fabulous. Love the fun color of your top as well. I never would have guessed you were wearing a wig! It’s a nice length too. Did I read somewhere that you were originally from Michigan? Are you a snowbird now? Have a great week! Pingback: Ok, I Need Your Help Again. Keep or Ditch? - When the Girls Rule - 40+ style for women with big-busts, apple-shapes and style! You look fabulous in pink! And I would have never ever thought that you are wearing a wig! Looking fabulous! The pinky purple of that top is amazing and suits you so well. I’m feeling inspired to try brighter colours now! I would never had known you’re wearing a wig…it looks great! I love that bright pink on you and the cuff bracelet is stunning! You look gorgeous in those beautiful colors, your jacket makes a perfect color combo with the blouse! What a totally stunning color on you! And I would have never guessed that wasn’t your hair….gorgeous! That’s a gorgeous blouse Patti -you have some amazing thrift finds! I love the way the stone in the bracelet echoes the colour. You look great in that color. I love Tahari. The hair is great, too. My mom had a wig back in the ’70s, for bad hair days. SIL had one post-chemo. That motivated daughter to grow out her hair then lop it off to donate to a group sponsored by Pantene that gives real-hair wigs to cancer patients. What a stunningly beautiful color on you! Just lovely. I love these vibrate colours on you! Thrifting is fun! I wash many of my clothes by hand. You always look so fabulous in bright colors, especially jewel tones. Thank you for reminding us to stay visible and for hosting. OMG … I think this is one of my fav looks on you ever! Head to toe fabulous … that color is amazing on you! Amazing colors Patti!!! So, you are proof it IS possible to age in reverse..that skin, that hair, that beauty..you shine!!! First that blouse is just amazing—I adore the colors! Second, I would have never guessed it’s a wig! I have 2 wigs, that I just love. I haven’t been wearing them much lately, but to me they are the bestest ever—I never have a bad hair day with them. Oh, the silk blouse is beautiful, and the colour is amazing! You are a thrifting master! I love that bracelet! And thinking about Bella puts a smile on my face…I don’t see the LINKY though.